The concepts of productivity and free trade go all the way back to Adam Smith, widely considered the “father of economics,” who wrote the original capitalism Bible called the Wealth of Nations. Many of the same principles discussed in Smith’s historic book are just as applicable today as they were in 1776 when it was first published. Dividing up the 18 pin making steps (i.e., pull wire, cut wire, straighten wire, put on head, paint, etc.) lead to massive productivity improvements. Another economic genius that changed the world we live in is the father of mass production…Henry Ford. He revolutionized the car industry by starting the Ford Motor Company in 1903 with $100,000 in capital and 12 shareholders. By the beginning of 1904, Ford Motors had sold about 600 cars and by 1924 Ford reached a peak production of more than 2,000,000 cars, trucks, and tractors per year. Although, Ford had a dominant market share here in the U.S., the innovative technology and manufacturing processes allowed him to profit even more by exporting cars internationally. This transformation of the automobile industry allowed Ford to hire thousands of workers with handsome wages and spread 15 million of his cars around the globe from 1908 to 1927. Smith believed that parties with an “absolute advantage” in manufacturing would benefit by trading with other partners. Today, it’s fairly clear the U.S. has an absolute advantage in creating biotech drugs, Hollywood movies, and internet technologies (i.e., Google), however in other industries, such as industrial manufacturing, the U.S. has lost its dominant position. 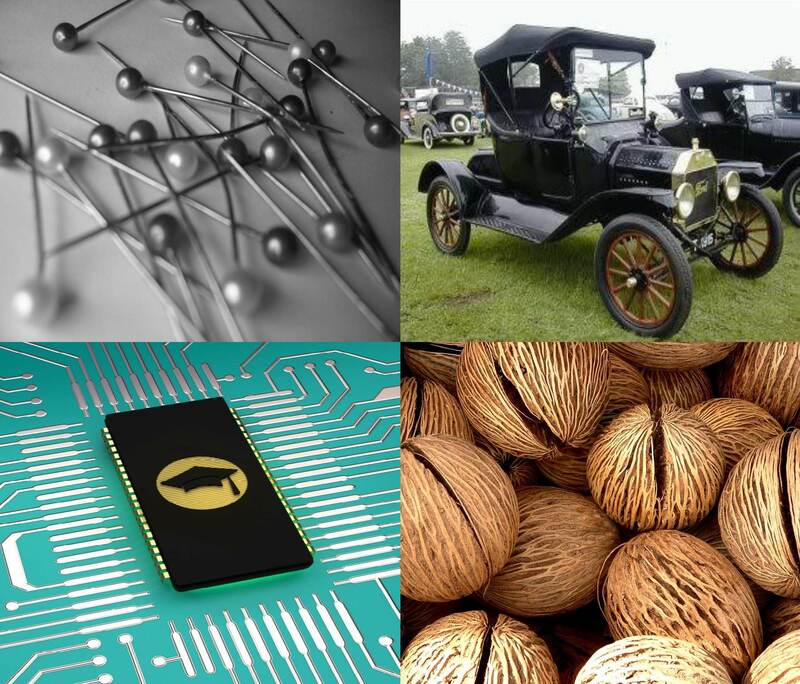 Let’s explore the comparative advantage concept some more by investigating coconuts and computer chips. As we hemorrhage jobs to other countries that can accomplish work more cheaply and efficiently, increasingly discussions shift to a more protectionist stance with dreams of higher import tariffs. Is this a healthy approach? Consider a two nation island able to produce only two goods (coconuts and computer “chips”), with the U.S. on one half of the island, and the Rest of the World (R.O.W.) on the other half. Next, let’s assume the following production profile: The R.O.W. can choose to produce 10 coconuts or 10 chips AND the U.S. can produce 4 coconuts or 8 chips. Scenario #1 (No Trade): If we assume both the R.O.W. 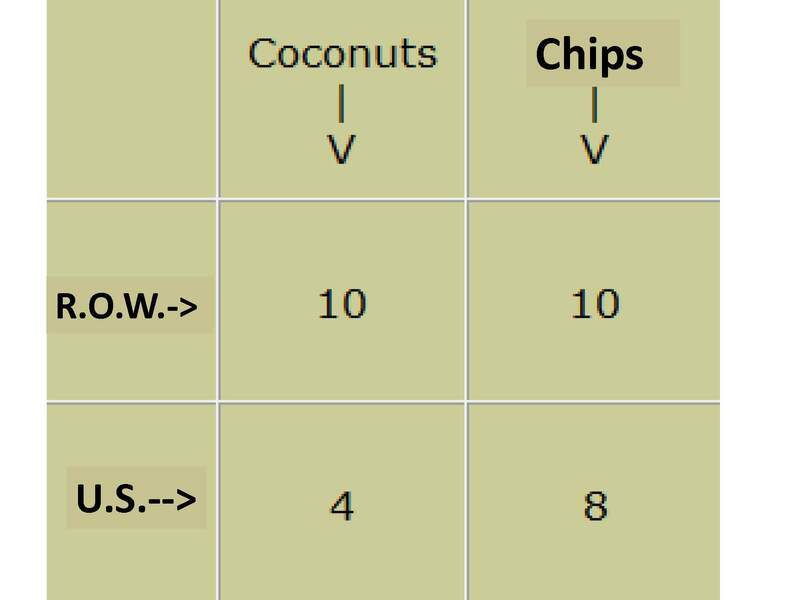 and the U.S. each spend half their time producing coconuts and chips, then the R.O.W.’s production will create 5 coconuts/5 chips and the U.S. 2 coconuts/4 chips for a combined total of 7 coconuts and 9 chips (16 overall units). If we were to contemplate the ability of trade between R.O.W. and the U.S., coupled with the concept of comparative advantage, we may see overall productivity of the nation island improve. Despite the R.O.W. having an “absolute advantage” over the U.S. in producing both coconuts (10 vs. 4) and chips (10 vs. 8), the next example demonstrates trade is indeed beneficial. Scenario #2 (With Trade): If R.O.W. uses its comparative advantage (“more better”) to produce 10 coconuts and the U.S. uses its comparative advantage (“less worse”) to produce 8 chips for a combined total of 10 coconuts and 8 chips (18 overall units). Relative to Scenario #1, this example produces 12.5% more units (18 vs. 16) and with the ability of trade, the U.S. and R.O.W. should be able to optimize the 18 units to meet their individual country preferences. If we can successfully escape from the island and paddle back to modern times, we can better understand the challenges we face as a country in the current flat global world we live in. Our lack of investment into education, innovation, and next generation infrastructure is making us less competitive in legacy rustbelt industries, such as in automobiles and general manufacturing. If the goal is to maximize productivity, efficiency, and our country’s standard of living, then it makes sense to select trade scenario #2 (even if it means producing zero coconuts and lots of computer chips). The coconut lobby may not be happy under this scenario, but more jobs will be created from higher output and trade while our citizens continue on a path to a higher standard of living. The free trade strategy will only work if we can motivate, train, and educate enough people into higher paying jobs that produce higher value added products and services (e.g., computer chips and computer consulting). There is a woeful shortage of engineers and scientists in our country, and if we want to compete successfully in the modern world against the billions of people scratching and clawing for our standard of living, then we need to openly accept the productivity and trade principles taught to us by the Adam Smiths and Henry Fords of the world. Otherwise, be prepared to live on a remote, isolated island with a steady diet of coconuts for breakfast, lunch, and dinner. *DISCLOSURE: Sidoxia Capital Management (SCM) and some of its clients own certain exchange traded funds and GOOG, but at the time of publishing SCM had no direct position in any other security referenced in this article. No information accessed through the Investing Caffeine (IC) website constitutes investment, financial, legal, tax or other advice nor is to be relied on in making an investment or other decision. Please read disclosure language on IC “Contact” page. Entry filed under: economy, Profiles. Tags: absolute advantage, Adam Smith, comparative advantage, David Ricardo, economics, free trade, Henry Ford, Wealth of Nations. Does Double-Dip Pass Duck Test? M&A: Top or Bottom?